Let me tell you before you read the report from PI of Products, this is a spectacular idea for any pet lover. I received updates through out the entire process from PI of Products. I am amazed at how beautiful this turned out! Melissa Smith Art Pet Portraits! All you have to do to get started is send Melissa a picture of your pet, and preference on background color. If you're not sure, ask Melissa and she will help you decide which would look best. We asked her and she thought green would go well. This is the photo we sent! 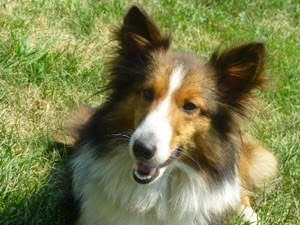 We have six dogs so it was pretty hard to choose just one, but I decided on Lady Grace (one of my mom's Shelties). Now, I was going to save it as a gift for my mom, but after receiving the first "update" I decided to tell her. She really enjoyed watching the painting come to life (Melissa posts the pictures of her current projects on her blog and social media). The First picture of her progress. A little bit of information about the Pet Painter... "It all started with a department store shopping trip in 2005 where I laughed out loud after spotting a framed poster of “Major General Woof” by Massy and said to my husband, “I could paint something like that of Dacs!”, speaking of our Chihuahua mix we had just rescued at the pound. So I did! I have found that being a pet portrait artist is my true life passion, especially capturing candid moments in time, in a cherished pet’s life. “Our pets give us unconditional love and I am proud to have found a way to honor and commemorate them. 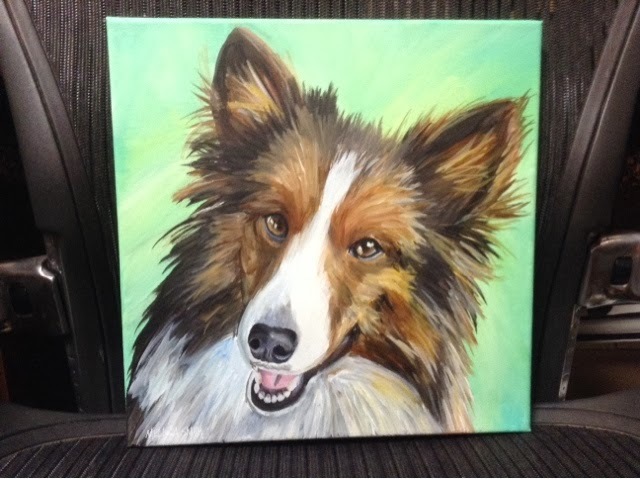 The bond between pet and owner and the profound love people have for their pets truly inspires me, and there is nothing that gives me greater joy than my client’s reactions to their completed painting!" The second update - eyes, nose and mouth. Another plus to ordering a portrait of your pet is that you can help make a difference for a less fortunate pet. 10% of your order goes to a pet rescue organization of your choice! Wow! It's coming along really nicely! Melissa does very detailed work. Just look at the finished picture! Everyone we showed it to, could tell who it was and thought it was very well done. And... it's done! We LOVE it! 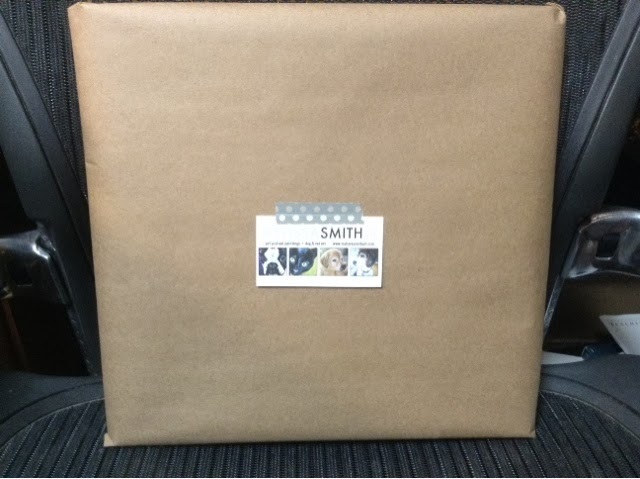 So, if you (or someone in your life) has a pet, head on over to the Melissa Smith Art website, and start your order! You can also Like them on Facebook and Follow them on Twitter to stay up to date with their latest news and paintings. Our 8x10 Pet Portrait... ready to hang on the wall! 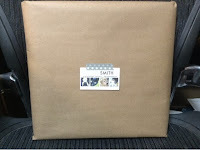 Melissa Smith Art is going to send a 8x10 Custom Pet Portrait to 1 of of our Petacular readers! Please share this giveaway with your friends and family! We'd love a portrait of Georgie, a Pomeranian! My dog's name is Folly and she is a Westie. I would love a portrait of her! Gee, I have five Treeing Walker Coonhounds and three cats. Picking just one for a portrait is hard, but I would have to go with either Ran, my deaf hound girl, or Kyoko, my beautiful tri-color Walker girl who I adopted after she was nearly starved to death. I might have to flip a coin. I would have a picture of Dexter my Boxer, or Charlie my Frenchie. I would get my Golden Retriever Mix done. We are not sure what Artie is mixed with, but he is adorable. I would my standard poodle and my cat. I would love to have either our Rat Terrier (named Sugar) or our Sheltie/Beagle mix (named Cinnamon) done. If lucky to win this awesome giveaway the hubby and I will have to flip a coin to see which one will be painted. Day-Z is my 5 year old Jack Russell.